Before providing you with a quote, Tom the Window Cleaner will take into account how often you require the service, how easy/difficult access to all areas is, and will happily answer any questions you may have. Residential Window Cleaning – A regular and reliable window cleaning service using the waterfed pole system. Tom the Window Cleaner can clean you windows weekly, fortnightly, 4 weekly, 8 weekly or just as a one off. All UPVC window frames and window sills are included in the price. Commercial Window Cleaning – If you have a commercial property, and need a regular window cleaner, Tom the Window Cleaner has over 10 years experience in this field, is fully insured and competatively priced. The waterfed pole system is used on commercial sites, due to health and safety legislation. 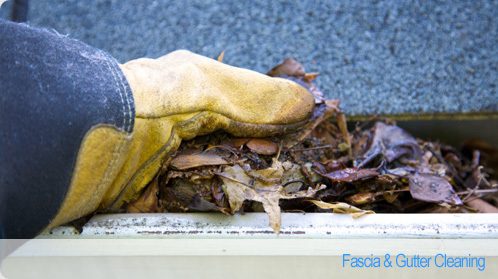 Fascia & Gutter Cleaning – Gutter Cleaning is one of the most important things you can do to maintain the beauty and value of your home. Without regular gutter cleaning gutters become full and heavy, they pull away from the wall and the proper angle of the gutter becomes distorted. As water overflows, it leaks behind the gutter and can travel into your home or damage your fascia boards. Allowing your guttering system to work as designed and lead water away from the roof and walls will minimise possibilities of water damage. All accessible guttering is firstly cleaned out, removing all moss, silt, muck, leaves and debris any blockages are unblocked, and then the guttering, fascias, soffits, and downpipes are thoroughly cleaned on the outside using the waterfed pole system. Builders Cleans – Tom the Window Cleaner has worked on numerous different jobs on site, which enables him and his team to be able to complete this kind of work efficiently and to a high standard within this challenging environment. A big emphasis would be placed on Health & Safety in order to carry out any work within the guidelines of the HSE. End Of Tennancy Cleans – If you are moving either in or out of a property, and are in need of a thorough deep clean, why not give me a ring and ask for the 'End of Tenancy' service. The End of tenancy cleaning is carried out by a dedicated team who specialise in detailed deep cleans. They are fully equipped with all equipment and chemicals needed in order to blitz any property. You can have a look at the checklist we use, in order to see what is included in the End of Tenancy cleaning. We are fully insured and all work is guaranteed, meaning if you are not completely satisfied with the job, we will come back to rectify any areas free of charge. We work on a fixed price, rather than an hourly rate, this way we finish the job no matter how long it takes for the price quoted. Patio & Driveway Pressure Washing – Our cleaning machines are purposely designed to restore driveways, paths and patios by providing a unique deep cleaning system which is effective enough to remove tyre marks, weeds, moss and most oil stains. Carpet Cleaning – The major carpet manufacturers recommend a professional carpet cleaning every 6 to 12 months to maintain the appearance and warranties of your carpeting and we well know that when the correct care is given, carpets will last for many years. Replacing carpets after accidents, spills and hard to remove dirt can be very expensive. We help your Carpets look like new as well as give you big savings on getting your carpets professionally cleaned by us. Protecting the money you’ve spent on quality carpets. We can offer a scheduled carpet cleaning service over 12 months, or just a one-off carpet clean. Bird Prevention – Bird fouling and nesting debris can seriously damage a buildings aesthetic appearance. This can present a negative image of your business or home as they contain biting insects and parasites as well as a very unpleasant smell. Bird droppings have an acidic content which is corrosive to paintwork and masonry. Droppings and nest materials can also block gutters and downpipes which can damage the pipes themselves as well as causing water damage to the building. Nest debris can block air intakes and air conditioning units causing mechanical faults which can be costly to repair. Should you have a problem in this area contact us for a competitive quote. Graffitti Removal – We are able to use high-pressure water-cleaning equipment combined with non-hazardous Graffiti removing chemicals in order to entirely remove graffiti from any type of porous or non-porous surface without harming the underline facade.